Schools are living organizations that face many decisions in terms of daily, monthly, and yearly operation. There are always challenges and problems to be address, and though it may seem as there is a clear solution from our perspective, there are always multiple points of view to consider. Through working on attacking the wicked problem in class, it has been an opportunity to really consider how these types of problems are addressed in our schools today. Recently, I have had the privilege of sitting on a steering committee for a strategic planning initiative which has also given me insight into these types of problems. I think the fact that it is very easy to talk about this issues at a surface level makes them seem easier to solve than they really are. Once you dig into the complexities of the problem, and the challenges that solutions to the problem introduce, it is not so easy to discuss anymore. Also, people are emotionally invested in programs that are attached to the wicked problem so there is a personal level that touches people when you examine change. When we were discussing our problem, it was interesting how much educational jargon we were utilizing, but yet how we each had a different view of what those words meant. I think that it is really important that the problem be broken down clearly with the removal of as much jargon as possible – so as to not simplify the problem but provide clarity in understanding. The truth is, change can be difficult and challenging, but change can also bring with it wonderful new opportunities and improvements that make things “better”. I think that problem solving is truly more of an mind-set that involves continual analysis, tweaking, and honesty in addressing concerns and not being afraid to admit when something isn’t working as well as it could/should. For the MAET Y1 program, we were asked to read The Anti-Education Era written by James Paul Gee. The book is divided into two sections – the first focusing on why humans are in general stupid in the 21st century, and the second provides his ideas on how we can improve the situation. Personally, I found the first section of the book very repetitive and overly detailed, however the idea that we are not utilizing the tools that we have available for us to access to our full potential was my main take away. I found the second section of the book much easier to relate to my professional practice and the other readings we have been examining in the MAET Year 1 course work. Like every society before us, there are a number of complex problems that we have to face. I would hazard to guess that although the problems people faced before us, may not seem as challenging to us compared to what we face, I am sure that they were equally or more challenging given the context and availability of resources. Today, many problems are considered wicked, or complex in that there is no clear best solution to the problem – such as how do we change education to prepare students of today for the unknown future. In Gee’s opinion the reason that we are unable to solve these problems effectively is due to the fact that we are “short-cicuiting the circuit of human reflective action” (p. 11) through our process of formal schooling that does not allow for students to develop real world experiences and apply their learning in meaningful ways. In the book, Gee argues that in order to face these complex problems we need to utilize collective intelligence or a “Mind of minds”. Gee states that “we humans think and act better when we do so by getting the help of others and giving help to them” (p. 164). He promotes to use of affinity groups and affinity spaces to serve as a way to bring together individuals who share a common interest or passion, but have varying levels of expertise and a variety of backgrounds (Gee, 2013, p.174). Through the use of this collaboration, a wider variety of ideas, opinions, and thoughts can be brought into the wider forum, where they can be analyzed, synthesized, improved, and re-imagined into a better solution than could be thought of through only one perspective or outlook. The description of affinity spaces found on pg 175-177, reminded me very much of the maker movement and maker spaces. Thinking about how we can broaden this concept so that as a society we can be collectively more intelligent, I automatically think about politics and the role that politicians play in solving problems that they often are not really passionate, knowledgeable, or interested in. How could something like the maker movement or maker spaces be utilized in government to utilize the interests of passionate and motivated citizens? How can we utilize affinity spaces and groups in schools to promote change from the bottom up and develop policies that are meaningful for the people who are working on implementing them on a daily basis? When I look at the ‘wicked problem’ of meaningful technology integration, I think affinity spaces could be a valuable tool in creating a school culture that is exploring what technology integration looks like in a meaningful way. Take for instance that every Tuesday after school from 3:30-5:00 any teacher who was interested was welcome to attend the “technology integration space” in someones classroom. Here they could share tools they have been using in their classroom, look at new tools and brainstorm how they could be remixed into the classroom, create how-to video tutorials explaining what they are doing. Then they could utilize an online platform to store and share their discussions and allow other teachers to become a part of the conversations. Over time, their interest may grow and they may become “experts” at a specific form of technology integration. Also new members may join, after seeing the organic nature of the development and been interested in exploring technology in a non-threatening way. The important point is that all members of the group are valued equally and the individual development is based on the needs and interests of each person, not the same goal for each member. I think that affinity spaces and the maker movement provide an interesting approach toward developing solutions for problems that challenge us both inside and outside of schools today. The importance of being able to recognize ourselves as learners and continue to challenge our own understanding and thinking is a critical component of developing meaningful solutions for the future. The quick fire today was the 18-minute Marshmallow Challenge. If you haven’t heard of the Marshmallow Challenge, I encourage you to check out there webpage and arrange to host a challenge yourself. It is a great team building, problem solving task for all ages. Today we had 4 members in each group and each group was given the supplies specified by the official challenge webpage – 20 sticks of spaghetti, 1 yard of masking tape, 1 yard of string, and 1 marshmallow. Quickly as the challenge began, our group discussed the structural properties of triangles and began to construct a triangular pyramid. 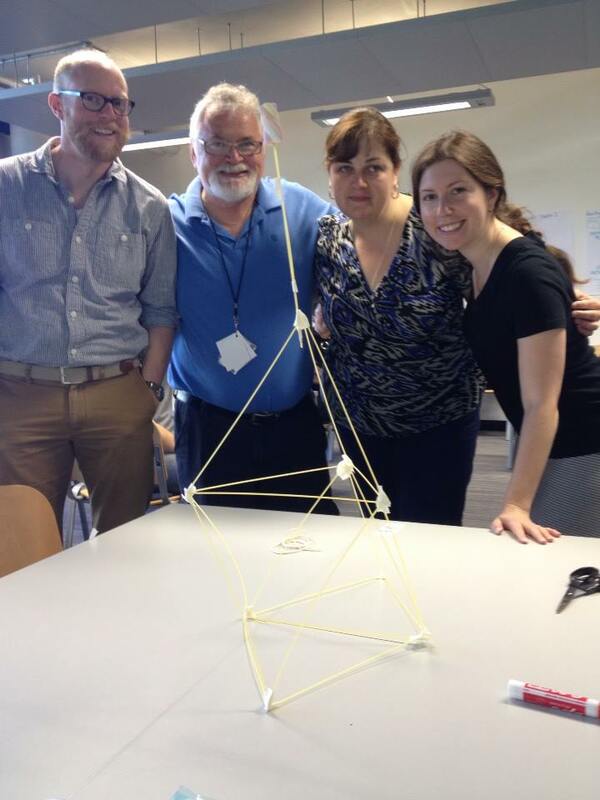 After building the pyramid, we discussed what the next step might be – would we built on top of the pyramid and attach the marshmallow there? We decided that it would be too heavy and would fall down, so we need to raise the pyramid that we had build up higher. Looking at the number of spaghetti sticks that we had left we decided to continue to build in the triangular pattern to try and rain the main pyramid, while still maintaining the structural integrity. In the end we attached our marshmallow to the top using two spaghetti sticks that we taped together at multiple locations for added strength. The structure was very stable and the marshmallow stayed as vertical as we could expect. In the end we were victorious but in the end everyone was able to learn some valuable lessons about design, innovation, creativity, and collaboration. After the challenge we watched the TED Talk based on the research and trends when this challenge is executed. It was interesting that some of the most innovate and creative designs were created by Kindergarten students, and the least successful when there was a monetary reward attached to the completion of the task. When I think about how these concepts apply to problem solving, I think it is important to try and not be attached to things that we know, and pay attention to what the problem is telling us. The process of iterative design, where by you make small adjustments toward improvement has very applicable uses in many types of problem solving tasks such as the Marshmallow Challenge. Iterative design is one thing that I spend a lot of time working with my Robotics Team on, completing small parts of the mission at a time to work toward the larger goal. I think that this concept can be utilized better in other areas for solving problems that are structured in messy or challenging parameters.